Djoser King owner of the Saqqara Pyramid , Djoseris most famous Kind in the 3rd dynasty of the ancient Egyptian's history ; He delegate Imhotep to build the first pyramid in the ancient Egyptian history to be his tomb that is mean Saqqara pyramid is Djose's Tomb . 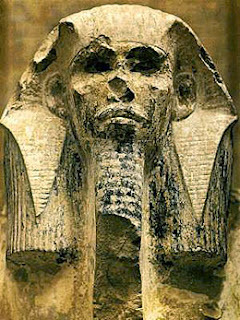 Djoser king ruled or region ancient egypt more 29 years from 2640BC - 2611BC . As per Manetho's Papyrus ; However , many historian said the reign length was 19 years ( 2630BC - 2611BC ) because Tarin's Papyrus refereed to 19 years only . Djoser was most strongest king in third dynasty in ancient egypt . 1 - Memphis was the ancient egypt capital in that period of time . 3 - Djoser was expended Egyptian's border south and west . Djoser's Statue was found in a narrow rooms known as Crypt ( Cerdab )- Crypt photos - locate northeast of the Djoser's tomb in Saqqara Pyramid . the tomb gradually expanded until the structure included six stepped up today, are still visible, high up to a height of 60 meters. 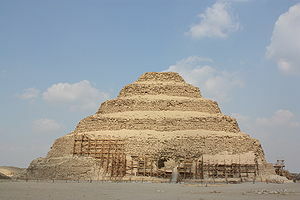 Depicting alleged by the architect Imhotep, the entire complex measures 277 X 544 meters and is surrounded by a high wall in which a real and false doors fourteen. Called secondary mastaba tomb and regardless of the pyramid itself, the compound includes among other things, open courtyards several, some of which is used in connection with the Festival of the dam, and the 'South Tomb', and two buildings that have been interpreted as a representation of the shrines and Upper Egypt Lower Egypt, and the basement with a statue of the king, and many other buildings. Sought the pyramid complex built entirely in stone, in the earlier tradition of the structures made of perishable materials. Each of the pyramid and Cemetery South Apartments contain groundwater, used for the burial of the king and one of eleven members of his family, which is partially decorated with blue faience tiles with the imaging performance of the rites of the king during a royal jubilee. so cool but the name of the real god of chaos is Set. Thats the only thing wrong with this site. I love this site the only the name of the god of chaos is Set. No Nico its King Toot. Lol. How Khufu's Pyramid was Built ? Who Built the Great Pyramid ?